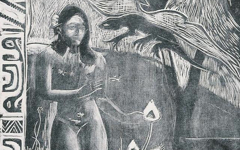 It's Spring 2015 and there is an excellent exhibition on Gauguin at Basel's Beyeler Museum. 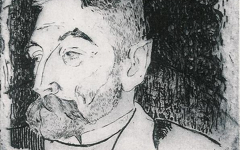 Among its treasures is this self-portrait of which little is said but that this is Gauguin. With its broad expanse of blood-red background, it stands out especially among other pictures of its era. But why? Gauguin was so highly articulate and knowledgeable about art theory, his choices here could not possibly be for mere design alone or, on the other hand as often suggested, to express his inner feelings or state-of-mind. What state-of-mind? What feelings? You can read into it what you like. It says nothing about either. However, if its details are similar to those repeatedly used throughout the history of art, one can at least presume that they are not there by chance or coincidence. 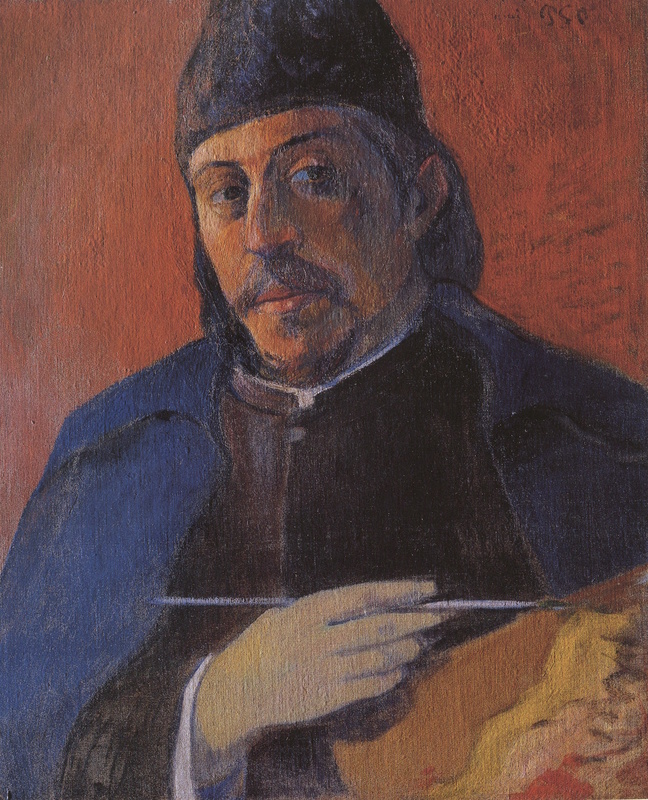 Gauguin, Self-portrait with a Palette (c.1893-4) Oil on canvas. Private Collection. Take his lapels. 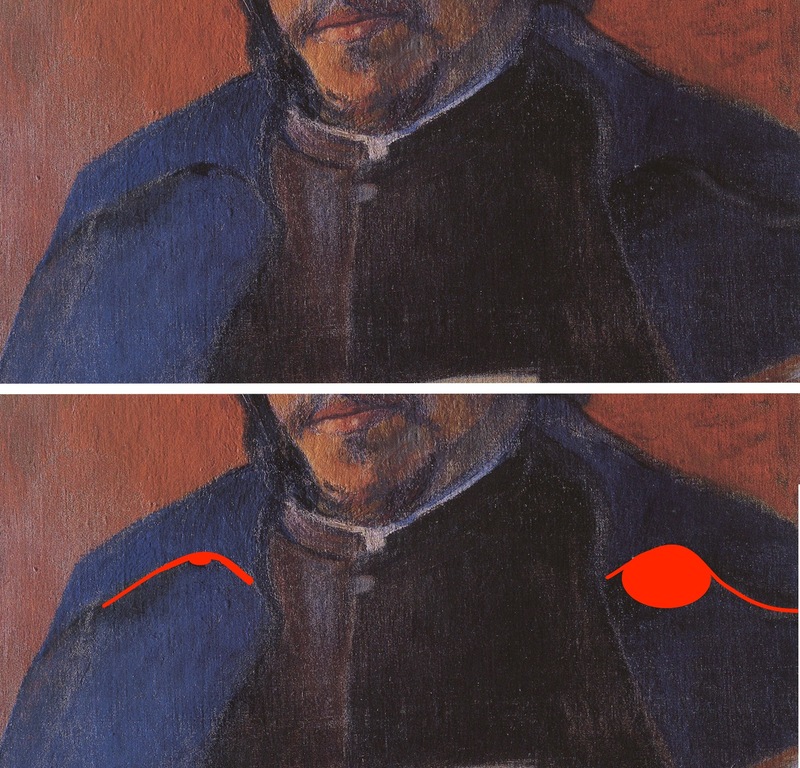 Like similar details in hundreds of other pictures, they are not only eye-shaped below his head but one has a dark circular shadow like a pupil while the other does not. They are the artist's "real" eyes - one closed for insight, the other open for out-sight. Through them he imagines the "painted self-portrait" above which looks real to us because we mistake normal perception for reality. Artists never do. For them, true reality can only be reached through the mind. 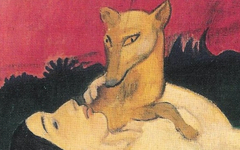 This is a mental image of Gauguin conceiving a self-portrait. That's why his hand directly in between those two "eyes" is painted in tones of such pale green and yellow that it appears unpainted. It looks nothing like the skin on his face - indeed, it is its polar opposite on the color wheel. 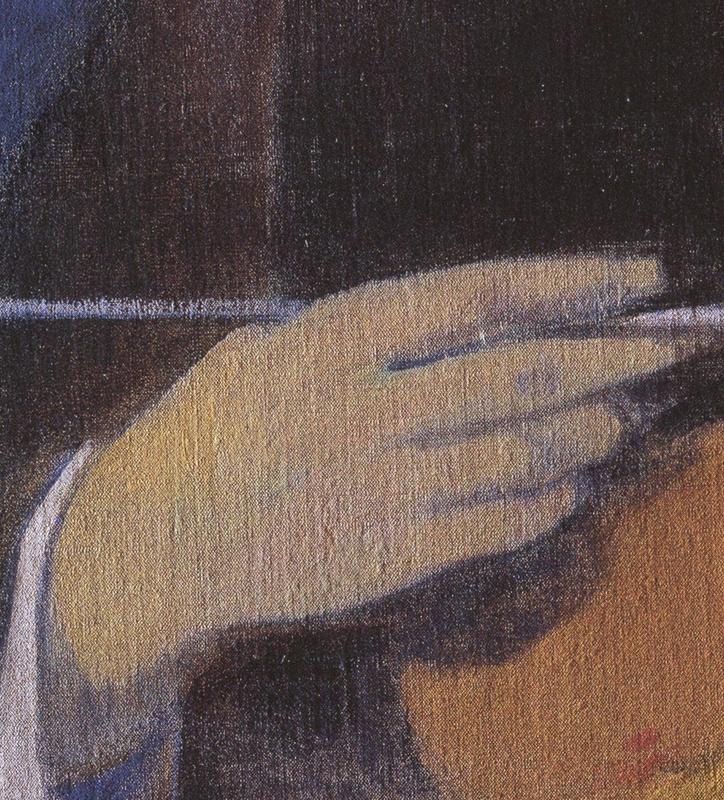 The palette, to which the brush points, contains the colors which, when mixed, will create "skin". Like Gainsborough's unpainted book in Mr and Mrs Robert Andrews (c.1748-9), it indicates that the painting is still in the process of creation and forever will be. Time for artists is spiritual. It is never the past or the future. They don't exist. It is always the "now", that ever-present moment which is always with us. See animal. Think artist. Especially with a knowing look and a furry paw. Original Publication Date on EPPH: 02 Apr 2014. © Simon Abrahams. Articles on this site are the copyright of Simon Abrahams. To use copyrighted material in print or other media for purposes beyond 'fair use', you must obtain permission from the copyright owner. Websites may link to this page without permission (please do) but may not reproduce the material on their own site without crediting Simon Abrahams and EPPH.